2) Renew / Replace the current security certificate with a new certificate prior to the expiry of the current certificate. 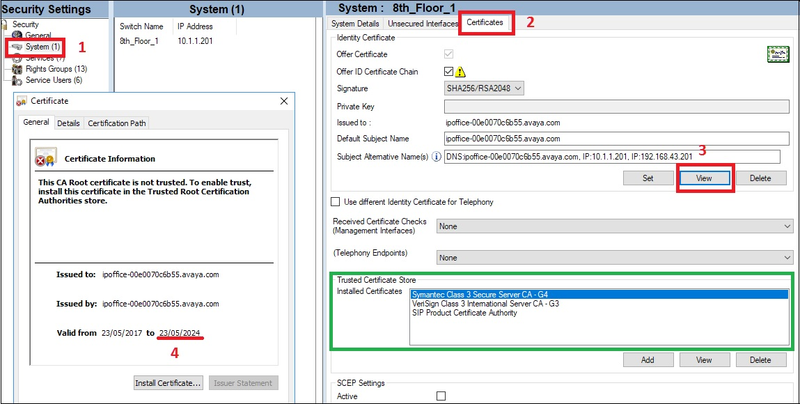 If the IP Office default certificates are being used, they can be regenerated from either Manager [in the security settings] or Web Manager. n the example above, the date shown above item 4. is not 31 December 2017 so this system does not generate the warning. The certificates highlighted in green in the Trusted Certificate Store are not related to this problem. Click on System and Certificate. Click OK and save the Security Settings. Log back into the Security and verify the new certificate has been updated with a start date of today and an expiry in 7 years.